Whether you’re starting to get hands on your own workshop, or just need an improvement in lighting, knowing how to shop for lights can be very helpful. Something as simple as a light tube can be troublesome if you don’t know what you’re really looking for. Buying shop lights is something that you’ll have to do at some point if you haven’t already. We recommend that you don’t wait until you need one to start digging up on shop lights. Plus, the tips and knowledge in this guide will prove their worth in the long run. Countless people have gotten stuck with cheap lamps that either didn’t light up space correctly or just didn’t last very long. If it hasn’t happened to you, then you’re in the right place, as this guide will tell you exactly what you need to know in order to avoid doing so. Unfortunately, it’s not as easy as picking a bulb. We’ll walk you through our compilation of the 10 best shop lights on the internet and our evaluation section. There, we’ll enter into detail on how to choose the right shop lights. The first place of our list is no one else than Hyperikon. With countless years in the shop light market, this brand is most likely the best solution for any of your lighting needs. Weighing 1 pound, the T8 tube presents 18W, 120277 volts, a corded-electric source and a 4000k color (daylight glow). Why use 36W fluorescent tubes when you count with Hyperikon’s 18W LED shop light? 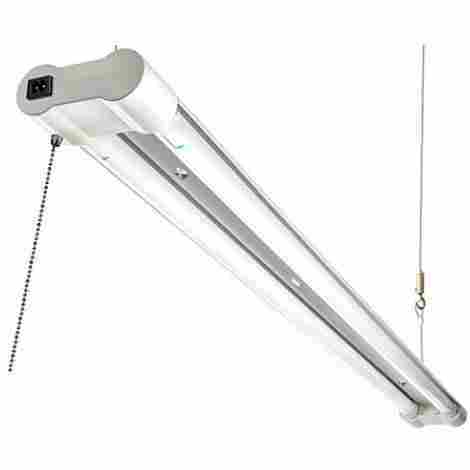 This product consumes 55% less energy than traditional 36W fluorescent light tubes. Additionally, lower consumption contributes to a lifetime of 45,000+ hours. Traditional glass is no obstacle to the quotidian threat of dropping things. The Hyperikon HyperBY-4C-405 doesn´t share this case, as a shatterproof construction makes the tube much more resistant. Even when partially broken, the tube may not shatter and continue to work. Regardless of its cost, everybody knows Hyperikon’s value in the shop light market. Which, by the way, happens to be fairly below the average value of the list. Our best recommendation is now at an affordable price. Unsurprisingly, this brand makes a second appearance within the top 3 products. This tube weighs 4 pounds with dimensions of 48x12x6 inches. It projects 5000k color (crystal white glow) and the frame is made of steel. This general purpose shop light runs on 120V and is cord-powered. This product holds DLC qualification for a top potential rebate with your service provider. Hyperion’s second entry is ideal for any big space that requires enlightening; rooms, workshops, storages, and even industrial spaces. Hyperikon counts with utterly strict production standards. Amongst them is a minimum of 45,000 hours lifetime (21 years), as well as the reduced consumption double-fixture 38W lights. 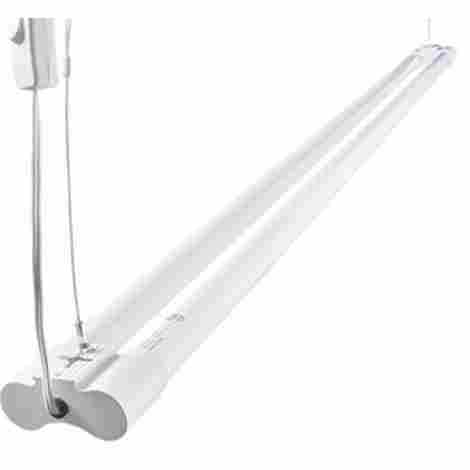 Normally, two fluorescent tubes can consume up to 100W as opposed to this product. The cost of Hyperikon lights varies with the type, but the H&PC-66409 still manages to stay below the average value of this guide. Considering the quality, durability, and color of this lamp, the price is more than fair. We recommend this purchase. This option takes the last place of our top 3 shop lights with the 1284GRD RE tube. The dimensions of 48.2x12x4 of choice steel weigh 10 pounds and are powered by pull chain. It runs on 120V and 32W, with a linear fluorescent lamp. Needless to say, it also counts with Lithonia’s reputation for quality shop lights. The lamp is protected by a steel wireguard that surrounds the four bulbs. Its surrounding shape is thought after workshops and similar environments where the lamp may get hit. The lateral panels of the wireguard also create a better distribution of the light in a downward angle. This protector is easily detachable and requires no tools to mount or dismount. This brand's lamps are generally easy to mount, but this one is particularly easy. The four-tube fixture is carefully assembled inside the package with decent thick sheet metal. Internal wiring is clean and organized. The box includes two 18” chains, about 2.5ft cotton string, two S-hooks, and the installed fixture, ready to mount. Lithonia lamps do a pretty good deal for what you pay for them. They’re not cheap, but not expensive either, yet one of the best shop light brands out there. Normally, this is not a lamp that you end up returning or claiming. Once again Hyperikon appears on the list. This time, the dimensions of the lights go 96x1x1 inches with an item weight of 2 pounds. The super-bright color output consists of nothing less than 6000k, running on 120V and 36W. Counts with a FA8 base, a shatterproof construction, and is dual-end powered. Illuminate a large space with over 4000 lumens. Hyperikon delivers light that has no comparison against old fluorescent tubes. The super-bright LED illumination will bring light to every corner of your workshop through high-output 8ft LED tubes. Consumption is optimized to reduce energy expenses. These LED tubes will work almost anywhere. 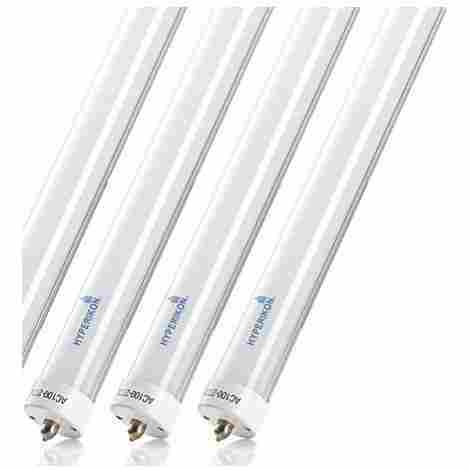 They’re the ideal replacement for 8ft fluorescent tubes. This product is compatible with existing T8 through T12 fluorescent fixtures, making it extremely easy to convert to new light. Improve your lights with bulbs that you probably won’t have to change ever again. The amount of Hyperikon entries on this list should tell you something about their products and customer satisfaction. It’s hard not to fulfill your expectations when you’re obtaining this product, despite it exceeding the average value of the list. You’ll hardly get this color and functional quality for this price again. Fifth on the list comes Neiko with their cordless 40464A lamp. It can be your salvation for emergency car repairs and garage or workshop usage. 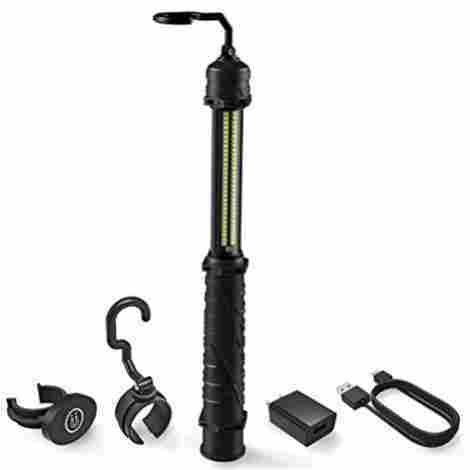 The rechargeable lamp runs on a 4000mah Li-ion battery with a 3.7V source. The lamp counts with 60 surface mounted SMD LEDs in a wand-like arrangement. Requires 4 hours of charge before being able to run for 5 hours. This cordless lamp is one of the best at its purpose. The light can be held on its rubber handle to be used as a light stick on emergency occasions or just casual use. It also includes two swiveling hanging hooks for hands-free use. Lastly, a detachable magnetic base mount allows you to place it on metallic surfaces. Thought after portability and convenience, this lamp counts with an aluminum body. It includes a transparent, yet sturdy plastic lens that acts as a protector for the LED bulbs. Despite being light and portable, the frame will survive low to moderate impacts, maintaining the integrity of the lamp. Neiko makes a pretty affordable entry in comparison to the rest of the products. Keep in mind, though, that this is a portable light for casual use or emergency purpose. It’s cost-performance efficient, but by no means as functional as a full shop light. Sixth on the list is this LED shop light. 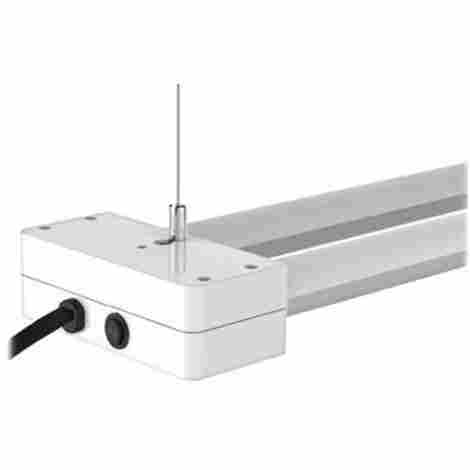 The linear shape light requires an AC power source, 120V and 36W to run. Its dimensions are 47.2x3.5x1.4 inches, with an item weight of 2 pounds. A luminous flux of 1800 lm is intended for indoor use only, with an integrated switch, hanging hardware, and quick-mount instructions. Still using old fluorescent lamps? Get better lighting for a fraction of the power. LUCECO’s LED shop lights generate around 60% less consumption in comparison to fluorescent lamps. The integrated LEDs will provide much better lighting, for many more years in comparison. Aside from a decades-long lifetime, the lights count with a fixture that meets the UL Certified Mark. A sturdy, frosted fixture complement the shatterproof build. The lamp stays cool when lit and counts with a strong thermoplastic housing. It creates no hot or cold spots, buzzes, flickers, or annoyances. LUCECO is not the most-known shop light manufacturer out there, but this says nothing of their products. This particular lamp puts up a great build for a pretty affordable price, mixing durability and quality into one lamp. ProFusion introduces a combination of heat and illumination in a single product. The item weighs 7.45 pounds and measures 26x14.4x4.8 inches. For lightning, a halogen lamp is used with 25W, controlled by an easy-pull string. It also acts as a 1500 Watt workshop heater, going up to 5200 BTU. 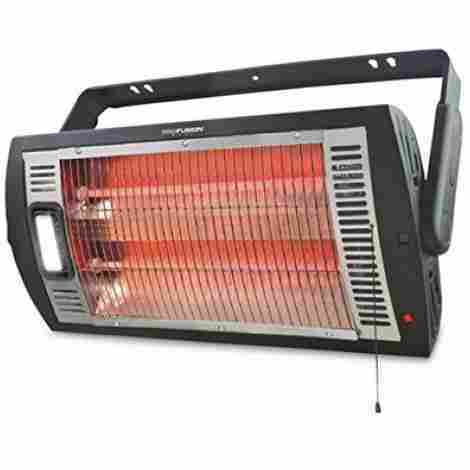 The ProFusion HQ1500 will provide you with both warmth and light. It counts with two different heat settings to adjust intensity and efficiency in the long run. Both elements (the heater and the lights) are easily controlled with a pull string. Its durable metal housing makes it ideal for unheated garages and workshops. Aside from warming and illuminating, the ProFusion HQ1500 allows you to carry it with you. The rectangular lamp is held by a 90-degree tilting arm that acts as both a handle and a support for inclined stance. Its compact size is the ideal fit for a car, emergency bag, or small storage. When talking about integrating two technologies in one, it’s only logic for the price to rise. Despite exceeding the average value of the list, this product does something no other product in the guide does; act as both a heater and a light. Not to mention its build is straight quality. Lights of America makes it eight with their LED 8140SE2-WH5-29 lamp. Measuring 4 foot and weighing 21 pounds, the lamp is an efficient way to bring light into a garage, workshop, basement, or utility room. Using just 40W the lamp outputs 4,500 lumens and 5000k color, allowing you to see everything clearly with minimal energy consumption. This company likes their products to be up in no time. This is why the package includes all the necessary mounting hardware as well as the hanging chains. The sturdy aluminum housing is easy to set up with the chains. With the hardware and mounting instructions, your light should be installed briefly. This company designs lamps that you hopefully won’t need to replace ever again. This particular product counts with 5000k color at 40W, which not only saves energy but also lifetime for the bulb. Smart consumption will make your lamp last considerably longer than traditional, high-wattage lamps. Four feet of 5000K LED lamps don´t come cheap anywhere, but Lights of America does a pretty good attempt at making it happen. Although you´ll spend more than the average value of the list on this product, you’re likely to be proud of every cent. If you’re looking for fluorescent lighting tubes, this option is probably the best solution. 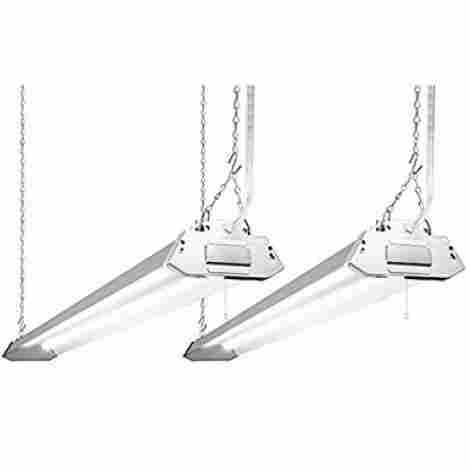 This HB-4/T5 lamp weighs 12.8 pounds with fixture dimensions of 48x13x4 inches. 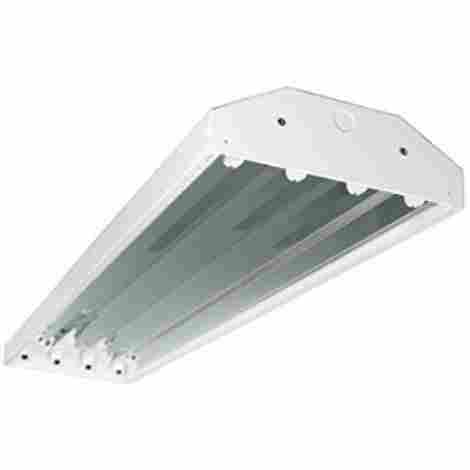 A linear shape and a T5-4 Light style are bright enough for a deposit, garage, workshop, and any roomy environment. The whole light runs on 120V and 216W. Durability is assured by the heavy gauge steel body and an iron phosphate treatment. Aside from being physically resistant, the frame will prevent rust from damaging its integrity. The body allows for easy attachment and detachment without the use of any tools. The bulbs are easily incorporated. 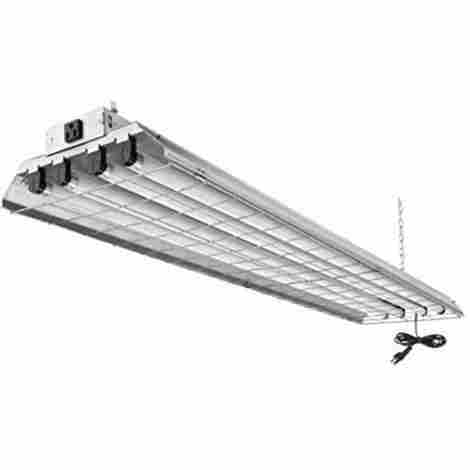 This High Bay goes as high as 95% with Vega-95 aluminum for optimal efficiency. The shape of the frame helps distribute light at a better angle, requiring fewer lamps to illuminate a large space. It emits no noises or flickers, allowing you to enjoy constant, quiet lighting. Suns & Stars offer a price that exceeds the average value, as well as what most people would like to pay for fluorescent bulbs. Regardless, Suns & Stars have decades of experience in the market and have proven on multiple occasions the quality and durability of their products. Last but not least is Feit’s lamp. Dimensions of 48x4x2 inches end up weighing just 2.3 pounds in T8 shape. This light runs on 120V and 38W, which is an acceptable consumption standard. It emits bright 4100K color and a luminous flux of 3700, ideal for both indoor and outdoor environments. This lamp option is the last of the list, but still the 10th best we could find. This is in part because of its no-delay ignition; your space will be lightened up in a matter of a second. Included are a 5ft plug cord and 6-inch hanging wire so you can place your lights how it suits you the most. This company reports an average lifetime of 50,000 hours, which is fairly over 20 years. This means that, given that you take care of the lamp, you’ll never have to touch the bulb. Will continue to go as bright (or nearly) through the years without flickering or fading in color. What if we told you you’re getting 50,000 hours of lifetime for nearly half the average value of the list? Because that’s exactly what goes on with the Felt 73991 lamp. 4100K color, 38W consumption and a luminous flux of 3700 for a couple of $10’s. Doesn’t get much better than that. While researching for the best shop lights and evaluating them, we kept in mind the consumption rate. The amount of electricity consumed by shop lights is different from that of a lamp or traditional light bulb. Shop lights offer considerably more powerful light, and if you don’t check on its consumption, your electricity bill can be whopping. We evaluated the consumption of each light based on its purpose and size, as a bigger lamp clearly consumes more electricity. The proportionality of the consumption and size is important to keep in mind. A big light doesn’t necessarily have to consume a lot, LED lights now consume less energy than ever before. Less energy consumption also translates into a benefit to the ecosystem. The growing awareness is a factor considered by more manufacturers and users every day. We’ll explain some further factors that will help you find the lamp that lightens the best while consuming the least. Watts are the unit used to measure power consumption. Traditionally, incandescent lights offer brighter light as they require more watts. This is no longer the case for most lamps, as LED lights are different. Watts are not used to measure the output of a LED light, but rather in Lumens. A 10W LED light may output enough Lumens to beat a 40W incandescent bulb. Manufacturers offer different watt-lumen outputs; quality lights will emit more lumens per watt. Basically, the lamps convert electricity into light, and good lamps will give you more light (Lumens) out of less energy (Watts). It’s important to consider the proportion between these two, as it’s a key factor in determining the consumption of a shop light. Many of the fixtures out there were not designed for LED bulbs, as they’re relatively new. But, as LED bulbs consume far fewer watts, they can be perfectly used in an incandescent fixture. Do note that the fixture should state what the max wattage that can be used is. Product information normally includes the wattage equivalent, also called incandescent equivalent. This is a rough reference of what the LED output is in comparison to an incandescent light. A 30W LED, for example, may have an equivalent of 100W in incandescent light. The estimate tells you you’re using %66.66 less consumption. Lumens measure the amount of visible light that the human eye can perceive from a light source. More lumens means you’re receiving more visible light, and thus it gets brighter as the lumen output increases. Recently, the term “useful lumens” surfaced. It creates a difference between the light that the lamp emits, and the one we really receive. A globe lamp emits light in all directions, and in reality, you’re getting less than half of this light. Useful lumens refers to the amount of light projected in a 90-degree, downward angle, like a cone. The total lumens (labeled as just lumens) counts both the useful and the “useless”. Keep this in mind when comparing lamps. The voltage is a crucial factor to consider at the time of purchasing shop lights, or anything electric for that matter. It measures the electric current, which is basically the amount of energy that goes through. It’s not to be confused with watts, which is the power of the energy itself. Let’s relate these terms to a pipe of flowing water. The water pressure would represent the voltage; the higher the voltage, the more intensely the water would flow. It goes the same for electricity. There could be an electric current (voltage) that transports no charge. Your lamp must be compatible with your household voltage. Incompatibility will result in either permanent damage to the light, or the light not working. A 60V bulb in a 30V source will not work, as it won’t have enough electricity. On the opposite case, a 60V source will burn out a 30V bulb permanently. There are mainly two type of voltage for bulbs: low-voltage and line voltage. Line voltage is the standard source in the US and Canada, which is 120V. Low-voltage bulbs run on 12V instead, which requires a transformer to lower the voltage of a 120V line. Some fixtures include the transformer within it already. You must verify that the voltage is transformed, otherwise, the 120V line will kill the 12V bulb upon connection. Nowadays shop lights are more durable than ever. Both consumer and ecological standards have pushed manufacturers into creating durable, properly illuminating bulbs. A shop light bulb from a reputable brand should easily endure over 45,000 hours of active life. This easily converts to over 20 years. Obviously, you want lights that endure as much as possible. For new users, it may be difficult to determine the aspects that contribute to the durability. Keep in mind that LED lights are the most efficient and durable in the long run; another type of lights may serve you well but will last considerably less. That being said, the hours of usage also have a clear impact on the durability of a lamp. The product description should include the hours of active life. It represents the minimum number of hours that the light will work while turned on. The more you use it, the earlier its hourly lifetime will end. Lastly, note that a lamp can easily survive way over its publication time. If you own a lamp near its hourly limit, don’t throw it away yet, but do start looking for a replacement. In any case, don’t wait until your light is gone to start looking for another one. The fixture plays many functions in a shop light. To start with, it’s what supplies the bulbs with electricity. Think of it as the body of the light. If you get your hands on a cheap fixture, you can’t expect much more for your lighting. Amongst its functions, the fixture also acts as a shield that guards the bulbs, although this depends on its shape. Some fixtures will extend lateral panels around the lights that create a better lighting angle and at the same time protects the bulbs’ lateral. If you’re looking for a definitive fixture, we recommend going for stainless steel or another good metal. Steel pieces are clearly heavier, but aside from the moment you install it, you’ll barely handle it anymore. Please note that heavy pieces can be hazardous while installing, it would be ideal to find assistance, read the instructions, and to take your time. There are a plethora of fixture types that aren’t necessarily better than others, but rather different. Consider the small details like the pulling cord; if you’re investing in a good light, you can’t afford to be affected by a cheap cord. In some cases, you may end up pulling the lamp apart to change a cheap piece that could have been avoided. Make sure the size of the fixture is adequate for your bulbs. Always check the product details for the exact dimensions. The rest is a matter of personal preference, whether you use chains or another installation type. The hanging device’s resistance must be proportional to the weight of your light. At the end of the day, user care has a huge impact on the products. The best shop light can half its durability on the wrong hands, just like they can be enhanced on the right ones. Things like exposing the sockets of the lamp to dust can affect the connection with the bulb. We recommend following the manual included with the product for any procedure, particularly if you’re new to them. If there’s a fabric defect, the best choice is to contact the manufacturer, as trying to fix it yourself may void the guarantee. Note that lamps differ from one another and may not be similar to ones you’ve handled in the past. Locate your lamp in a place where it doesn’t obstruct common tools or objects. If a lamp was misplaced, the best thing to do is relocate it. You may not only end up smashing the bulbs but perhaps loosen the fixture on the long term to the point where it falls. Nothing good comes out of a falling fixture. The guarantee represents the dedication of a company towards their manufacturing standards. We kept this in mind while evaluating the products on this list. While the length of the guarantee has little to do with the functionality itself, it provides confidence to customers. If you’re spending a lot of money on lights, we recommend that you seek for a solid guarantee. Look for guarantees that are proportional to the money you are investing. A 1-month guarantee does little for someone looking to lighten a large garage for a good couple of years. Products that hold a better guarantee in relation to their price were given priority in this buying guide (while still considering all the other parameters). Note that, in most cases, the manufacturer will demand the receipt or a copy of it when claiming the guarantee. Do not get rid of the ticket nor the original packaging, as it’s requested in some cases as well. As mentioned previously, it’s not recommended to attempt to fix fabric defects on your own. Claim your guarantee. You may end up losing your money while trying to save some shipping time. The quality of the light is the main feature to consider while lightening determined spaces. Many other things are considered, but good illumination is what users ultimately want. Thus, lamps which offered poor illumination where off the bat on this list. It’s not as simple as putting “good lighting” on the package, though. Lights are a tricky subject, and some details that may be ignored can mark a huge difference. A quality light is composed of multiple factors working together, and the malfunction of one of them will considerably reduce the quality. Of course, it all comes down to the customer’s needs. A small, one-bulb fixture can offer quality light to a small room. The size of the lamp, number of bulbs, or color intensity are useless to consider if space hasn’t been contemplated first. You must have an approximate idea of the length of the space you need to lighten before purchasing an adequate light. More bulbs equal to more light. The number of bulbs you can use is determined by the fixture, four slots will allow for four bulbs. Increasing the number of bulbs has a series of effects; not only does the lighting quality increase, but also its range and intensity. Notice that bulbs are what ultimately consume electricity. Each bulb you add to the fixture is an extra multiplier to consumption. Four bulbs consume four times as much electricity. Some advanced fixtures will allow you to select the number of bulbs to turn on. While LED bulbs have to be translucent to let the light pass, the translucency can vary. The lens can be one of three options: clear, colored, or diffused. The diffused one is the most common and has a cloudy aspect, being the same color as the device. It helps diffuse the light evenly into the top of the housing. These are the best for high-suspended mounts with wider ranges. The clear lens is the completely transparent ones that allow you to see through the bulb. The viewing angle for these bulbs is narrower, meaning they disperse the light less evenly. However, the clear lens offers the best contrast between on and off, as they provide “pure” (or unfiltered) light. It’s the best bulb to work directly over the space you’re using. Lastly, color LED bulbs are just like clear ones. The exterior is colored but still translucent, used for higher brightness devices. These have a narrower viewing angle – you must look nearly head on to it to watch it properly. The diffuser is a piece that prevents light from affecting your vision. Some lights can be intensively bright and easily bother human sight, as we’re not talking about traditional bulbs. The lens may enhance your working experience just as much as it can affect it. It sits right below the bulbs and helps disperse light. A diffuser is not always a good option; it depends on the viewing angle you need. It serves the same function as the bulb lens, except that in an enhanced manner. When you’re having multiple powerful bulbs, the lens will not be enough to diffuse the light. It helps prevent the shining around the bulbs that normally stops you from seeing properly. The color temperature is what determines the shade of your white light. While all light may seem white, it really isn’t, it may just have a bit of tint on the bulb lens. This value applies to all white light, not just LED, and basically indicates how bright the white light is. It’s called color temperature because the hotter it gets, the brighter it lightens. Think of an iron as it heats and glows red – thus the expression red hot. It changes its color as it gets hotter and hotter. Light bulbs are the same. This is why this value is measured in Kelvins. The more Kelvins it has, the bright the bulb will be. When a bulb says 3000K, it means that its color represents 3,000 Kelvins or roughly 4940 Fahrenheit. If you were to heat an iron to such temperature, its glow would resemble that of a 3000k light bulb (if it hasn’t melted by then). Multiple shades of white exist. Warm white refers to the yellowish shade of white emitted by lower-kelvin bulbs, it stops being yellow at around 3000K. The actual white shade starts fading in at around 3000-3500K, all the way up to around 5000K, where it becomes cool white. From there onwards, the light gets bluer as the kelvins increase. The Color Rendering Index (CRI) measures the quality of the light itself. It helps predict how good the visual output of the light is gonna be. Basically, the index goes from 0 to 100 representing the quality of color, where 100 is the top rating. The closer to 100, the truer the colors of the bulb will look. A lamp with a higher CRI is preferential over a lamp with slightly better illumination but a lower color rendering index. We considered this during the evaluation of the listed products, and recommend that you do so while purchasing shop lights. Q: How far apart should shop lights be? In any case, the illumination range of the lights must be considered before anything. Normally the range is referred to height, as the light will diffuse more as it’s lifted off the ground. If we’re talking about space from the workbench, you should place the light at a height that illuminates just around the workbench of the work area for better lighting. If we’re talking about the space between lights, hang your first light at a comfortable height. After that, the ideal thing to do is to simply place another light where the range of the first one ends. If you have multiple lights, do this consecutively to illuminate the whole room. This is the optimal way to illuminate any space, but if your budget or space doesn’t allow you for multiple lamps, you may leave strategically-placed gaps between each lamp as it suits you the most. Q: How many shop lights do I need? That depends on the space you’re working on. A one-car or dual garage can be lightened up with just one shop light (if it’s a good one). This is not the case if the garage is exceptionally large; we’re talking about a garage where you can comfortably fit two cars, but not extra-large. Your purpose is also a factor to consider. It may be more convenient to place two softer lights than one strong in order to distribute illumination better. In any case, you can consult the store or seller with the dimensions of your space, and they should assess with a corresponding shop light. Q: How many shop lights can I place per circuit? A proper electric installation should occupy over 90% of the maximum load on the breaker. Good electricians recommend that only 80% of the potential load is used. From there, you can do your calculations based on the resistance of your breaker and the consumption of your lights. If you have a dedicated breaker for your lightroom, then its total resistance can be calculated from the lights. If not, you’ll have to keep in mind any other devices connected to the same breaker. All you need to do is multiply the wattage of the bulbs times the number of bulbs and you’ll have the consumption. Verify that it’s ideally under 80% of the breaker’s maximum load, or in special cases 90%. We don’t recommend placing any further load on the breaker, as a fluctuation or overuse will cause it to trigger off. You can normally run a large number of LED bulbs on a dedicated breaker. Q: How much does it cost to run a shop light? You can estimate the hourly consumption cost of a shop light by multiplying its consumption times your energy charge. Your energy charge rate can be found on your electricity bill and is measured in cents per kWh (kilowatt/hour). It may look something like $0.122/kWh. Multiply the number of bulbs times their consumption, 35W for example, so two bulbs consume 70W. Divide 70W / 1000 (because we’re using kilowatts), and multiply this by the energy charge rate ($0.122/kWh). Running two 35W bulbs would cost $0.0854 an hour at this rate. Q: How to install shop lights? Many shops light out there come already assembled and ready to install, all there is to do is hang them. In this case, first verify that you count with an adequate holder for the fixture, whether it’s chains or a fixed holder. Make sure it can take the weight, verifying both the information of the stand/chains/hooks and the one on the lights. Some other products will require a minimum of hardware for the installation, such as electric tape, a ballast, and mounting/dismounting tools. For this case, we recommend following the manufacturer instructions letter by letter. Always seek a helping hand when installing a fixture if possible. Q: What does dimmable mean? Dimming is an option in lights that allows you to select the degree of illumination. Normal lights have to states: an active one (on) and an inactive one (off). You either have all the light, or you have none of it with these bulbs. Dimmable lights are different. Instead of having an on/off switch, they normally have a selector that allows you to fade the light intensity. This allows you to reduce or increase brightness at will. They’re a much better choice, as a dimmable light will let you do more than a traditional one. Note that you can use a dimmable light on a non-dimmable circuit, but you should not use a non-dimmable bulb on a dimmable circuit. It may cause damage to the circuit, the lamp, or both at the same time, permanently. Q: Can a LED tube be shortened? LED tubes can’t normally be shortened. You’ll need to opt for a tube with the right dimensions for your fixture. We recommend not attempting to shorten a LED tube on your own, especially in the presence of inexperience. The dimensions of a fixture are non-flexible, and it’ll be hard for you to achieve the right size without professional tools. Even with the required tools, it would have to be an exact practice. 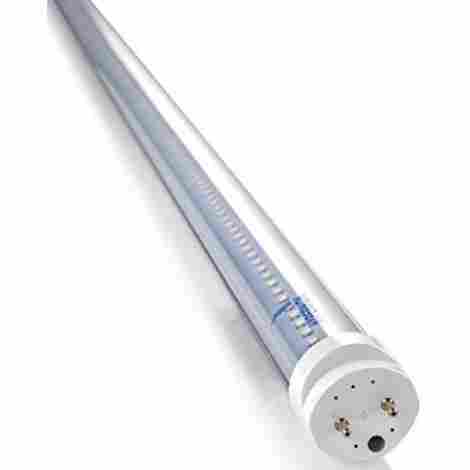 Shortening the LED tube may also cause a series of side effects in the long run. Q: What is the difference between a clear and frosted tube? A clear tube is completely transparent and allows for all the light to go through. A frosted tube, on the other hand, counts with a cloudy lens. It’s not as translucent as clear lenses, but it provides a better viewing angle from higher distances. Clear tubes are better for working on a closer space, directly above it preferably. Frosted tubes allow for better diffusion, meaning the light will spread evenly from a higher point. Note that when you’re dealing with particularly bright lights, the frosted tube won’t be enough, and you’ll require a fixture diffusor. Q: Can these lights be waterproofed? None of the products listed here are waterproof, and shop lights aren’t normally waterproof, nor any other bulbs. However, waterproofing could be achieved by sealing the fixture totally. The only scenario where we would recommend this is one in which the waterproofing is done by the manufacturer and with a guarantee. Cinema5D – What is Color Temperature? YouTube – LED Tubes: Frosted or Clear?